In today’s blog I’m going to be giving you an over view of what I have been up to in the last week and sharing some fun moments that have been memorable to me. Plus also to show you 3 new products I am currently working on. Firstly I have been getting ready for my craft stall in August 28th in Whittington Shropshire. I thought that it would be a good idea to order a hairdressing dolls head to showcase my hair jewellery on. Plus I thought it would be a good idea to use it to photograph some pictures of my jewellery accessories for my online shop which I’m almost due to open. I know that it has been a while coming but I have been researching all of the online shops out there in order to choose the one that is right for me. Although you can find my products to buy on here too. Please click for more information. I ordered some hair combs which I’m planning on decorating for brides. This is one of the new products I am working on at the moment. I received my order Friday for beautiful glass beads in the most softest pastel shades ever and they are excellent quality. They look very realistic and have a very high luster but they are faux ones so are cruelty free. I was so excited to receive them as I have some wonderful designs that I want to bring into fruition. I have also been getting creative for myself and making these daisy hair slides. The yellow middle has been customized to make the green yellow effect and the leaves have been lined with a pen knife to give the petal a more realistic look. They are still a work in progress as I want to thin the petals a little more so I have just ordered a pasta maker in order to do this. and then I will add them to my shop on here. It has been nice to have some free time to make some hair slides for myself too. Afterwards we went for for a lovely walk in the lovely countryside which is on my doorstep. It was only supposed to be a short walk but it turned into over a two hour one. But it was a lovely end to the day and created many happy memories. Have you made anything lately? It doesn’t have to be jewellery. If so please leave a comment of what you have made in the comment section below. And name one of your most enjoyable products that you have made. In this blog I am celebrating British Flower week and I’m going to give you some tips on how to find your muse! I adore flowers in their natural settings i.e growing in the ground or on bushes like my roses. I always ask people to buy me pot plants rather than flowers as once cut they don’t last that long. Flowers are alive just like me and you and hence why I chose to make artificial ones out of vegan silk clay (named because of the feel of the texture of the clay) like the ones I have made below. A delicate coloured rose in a soft lavender pink shade. This week is British flower week so I thought I would celebrate it by showing you some of the flowers in my garden. These often surround me when I am getting creative. There is something magical about sitting next to a rose tree and having its fragrance tantalize my nostrils. Plus I am always studying other flowers so I can learn how to make them artificially. My flowers and garden are my muse. This is part of my garden where I happily create surrounded by my muse: flowers, fresh air and wild life. Here are 6 tips to get your muse. Look around your environment for things that inspire you. It could be a garden, flowers even someone else’s creative projects. Write, let the words flow. Just writing can help generate creative thoughts. Read lots of different stories for example of people getting married and look at the pictures of their themes. This can really ignite your imagination. Go out in nature. She is one big muse. Visit shops that sell all of your items you need for your wedding day or other special occasion etc. With all of those vibrant colors, beautiful designs, and interesting contrasts you will soon emerge full of ideas. 5 Tips To Gain Energy & Momentum To Achieve Your Goals. In this blog I thought I’d give you an inside look at my new product line and how I’m getting the balance between business and life. I’m also going to give you some tips that have worked for me to energize me so I have the motivation and momentum to achieve all of my other goals. The sun is shining here in Wales and I’ve been in my garden taking some pictures of some hand crafted rose hair slides that I have made. Each petal is hand crafted to form the rose and I have had many happy hours making them. They are a new product line. I’m not a professional photographer but its a skill I have had to learn and am learning which I’m enjoying thoroughly. Getting the lighting right can be quite tricky as my garden is mostly full of sunshine but I was up early today and found a lovely shaded spot that didn’t reflect any shadows. My new product line. 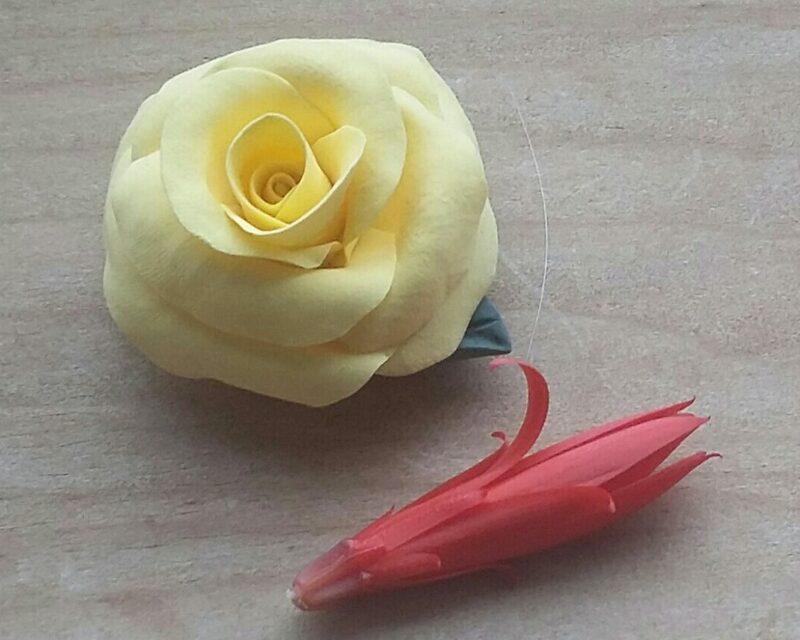 Hand made sculptured roses on hair slides. It’s easy as a business owner to focus on just one part of my life which is my business and forget about other parts. But this year has been all about getting more of that biz life balance which is crucial for a happy life. I have been making more time for things that are important to me for example spending more time with loved ones , my friends, and walking in the countryside with our dog. I’ve also been learning how to be. As the Italians would say ‘l’arte di non fare nulle.’ which translates into the art of doing nothing. Here is me just being or as some would say doing nothing. It is moments like this just sat on my swing in my garden with the stunning views of the rockery, roses and panoramic views of countryside that I reconnect to my own inner power source and gain powerful insights to move me forward. It also helps me feel more creative and energizes me. One of the things I have noticed since starting my business is that apart from writing my blog I haven’t been writing any poetry which is my other passion. My excuse is I have no time or no energy. So I made a conscious decision to make more time and make more energy! And that was done through going out in my garden. As I sat in my garden today just admiring the new rose buds on the bushes, the poppies and the lilacs in full bloom in all of their glory I had an urge to write my poetry. Nature certainly is great at inspiring me and she aligns me and gets me back in flow. It really uplifted me to be sat next to the flowers, watching the bees collect their pollen and hear the sounds of the cows and sheep in neighboring fields. I finally created a poem that I feel captures the beauty of my favorite flower..the rose. I thought that I would share it with you to brighten your day too or if your day is already bright to make it brighter. My poetry is important to me so its surprising to see that this is the first poem that I’ve created in the last six months. Finding the time for things that are important to me is crucial not only for a more successful life but also a happier and more fulfilling one. If we focus on just one aspect which sometimes I do and it’s normally my business then I find it impacts on other areas. Too many hours on your business affects well being and relationships. Alternatively if I spend too many hours on relationships and not enough on my business then it would effect my income an so on. It really is about getting the balance. And I’ve discovered it’s a continuous process. But to get that balance we have to replenish and fill our own cup up to the brim otherwise it’s a catch 22. I much prefer to go forward rather than in circles. Keep a diary of days of events for the week – from getting up to going to bed. Note everything you do even down to the TV programs you watch. Omit three unnecessary things your doing (it could be TV programs) and either replace with actions to achieve important goals or replace with time just doing nothing. The latter will give you the energy and momentum to get you started on your goals. Go out in nature and find your favorite flower or one that attracts you and just focus on it for a couple of moments. Observe its beauty, its colour, it’s fragrance and maybe even gently touch it so you can feel its texture. Engaging all of your senses to experience nature is exhilarating and raises energy levels immediately. Breath deeply, close your eyes and then open them again continuing to be mindful (observant) on the flower whilst breathing deeply. You will find that there is a mutual transference of energy between you and the plant. You will find yourself energized, connected and feeling more creative. It is such a wonderful way to feel. Sit in a beautiful place for at least ten minutes. It could be in the countryside or in your garden but make sure it’s somewhere quiet. Just sit there or lay down and practice the art of doing nothing. Your focus should be totally on your breathing. You’ll feel that beautiful brain muscle breath a sigh of relief as it gets a much needed rest. You’ll be surprised how much clarity you will have after doing this. Recite these words as many times as you can every day ‘I always have extra time, extra freedom and motivation for my goals, for the people and other things that are important to me.’ Your brain is listening to every word you say and your body responds accordingly to the messages you give it. This is what is meant by that mind body connection. Saying this on consistent basis every day will deliver amazing results. Stick the above mantra on sticky notes and put it on your bathroom mirror and on your computer. In fact any where and everywhere you are most likely to spend a lot of time in so it imprints on your subconscious. This will help you manifest your ideal reality. What tips do you have to replenish and motivate yourself? In today’s blog I am going to show you where I get my inspiration from and also share ten facts about about my favorite flower that often creeps into my jewellery. I am also going to tell you where my obsession with them came from. For those who know me you’ll know I’m obsessed with roses which often reflects in the type of jewellery I make. It started when I was about 10 and my nana bought me a rose for my garden which was named after me and called Melanie. It was a yellow rose with the edges all flecked with red. The fact someone had bought me a rose and it was named after me made 10 year old me feel really special. And I think that was were the bond was formed and hence why they have always been my favorite flower. I was in love with the smell, the silky texture and in awe of its beauty and how delicate it was yet strong at the same time. And so it started my love affair with them. And that rose is still in my mum’s garden today flourishing and thriving and looking as beautiful as ever. It obviously knows the secret to eternal youth! My mum has always had a garden full of them and I remember making perfume out of the leaves when I was a teenager. Over the years I have met others who have magnificent rose gardens and have made rose jam out of the petals which I have yet to try. Rose petals are very versatile and last year I made a rose face tonic from my own petals that worked wonders for my skin and made me smell beautiful as well. I often get asked where I get my inspiration from and its often the garden, garden magazines or even the statuses that my face book friends post. I’ll study a rose and think to myself ‘I’d love to recreate you’ and off I go to my workshop. But it’s not just roses I love it’s all flowers and have been studying blue bells wondering if I could turn my hand at them too. That will be a future project. Although I have always appreciated roses for their beauty I have to admit I have never known a lot about them. It is only since I got my house last year which has a huge garden that’s got quite its ample share of roses in it that I started to get really interested in how to look after them and find out more about them. I’d like to share with you some of the tips to looking after them that I have learned over the past year and some interesting facts about them. Roses come from the Rosaceae family and bear the Latin name Rosa. The first hybrid rose was introduced in 1867 by Jean-Baptiste Guillot. All roses before that date are known as old garden roses. The roses that come after that date are called modern garden roses. If you want your roses to grow big and strong pruning is necessary. You can do this mid February and mid March. Many varieties are cultivated but there are still varieties that grow in the wild. Where do you get your inspiration from and do you have any favorite flowers? Have any of you been inspired to make jewellery out them?